If it's festivals you want, festivals you can get in Korea. There's a kimchi festival, bullfighting festival, mask festival, whale festival, fireworks festival, sunrise festival, ice fishing festival, film festival, ginseng festival, and a bodypainting festival - and that's just off the top of my head. On any given weekend there are a handful of festivals going on in various cities throughout the country. Among the expat community in the country, however, no single festival garners nearly as much attention as the Boryeong Mud Festival. 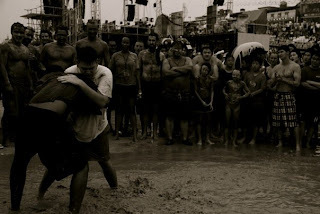 In a country as conservative as Korea - where beachgoers don't take off their shirts and shoulders are considered indecent - the Mud Festival is one place where naked flesh is not only expected, but required. Boryeong mud is famous for its nutritive properties; it is used to make cosmetics, soaps, lotions, and other toiletries. 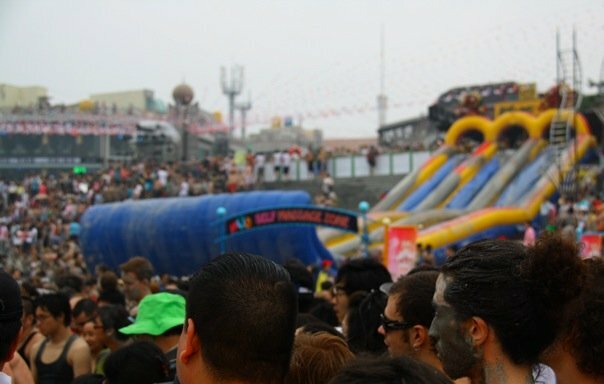 During the Boryeong Mud Festival it is applied more, well, liberally. The city trucks tons of mud from nearby mud flats onto the festival grounds, which abut the beach, and dumps it all onto inflated slides, obstacle courses, and mud wrestling pools. There are stations for painting your body with mud, stations for throwing mud at other festival-goers, even a "jail" station where festival staff will spray you down with mud (and for which you had to wait about an hour). 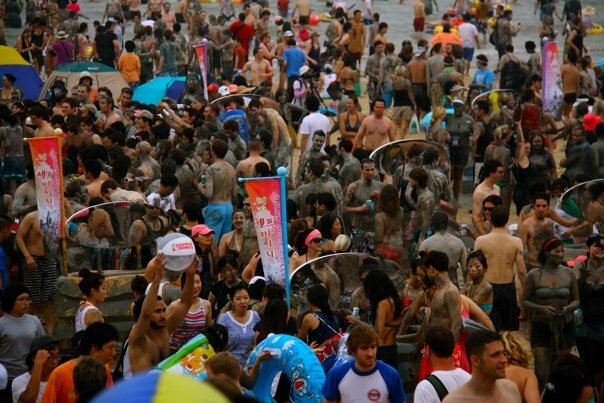 The Boryeong Mud Festival is about getting dirty, and for many people, in more ways than one. There are no (enforced) public drunkenness laws in Korea, and the prospect of getting drunk on the beach and smearing girls (or guys) in bikinis with mud is too much for a repressed population to resist. It attracts a wild crowd. Every third person is carrying a pitcher of beer in broad daylight, and perfect strangers indulge in public displays of affection without remorse. This, not surprisingly, is the chief complaint of the abstaining portion of the foreign population, who refrain from attending because they "aren't really into spring break." For the most part, though, the dirty, drunken foreigners carousing the streets of Boryeong are a peace-loving lot. 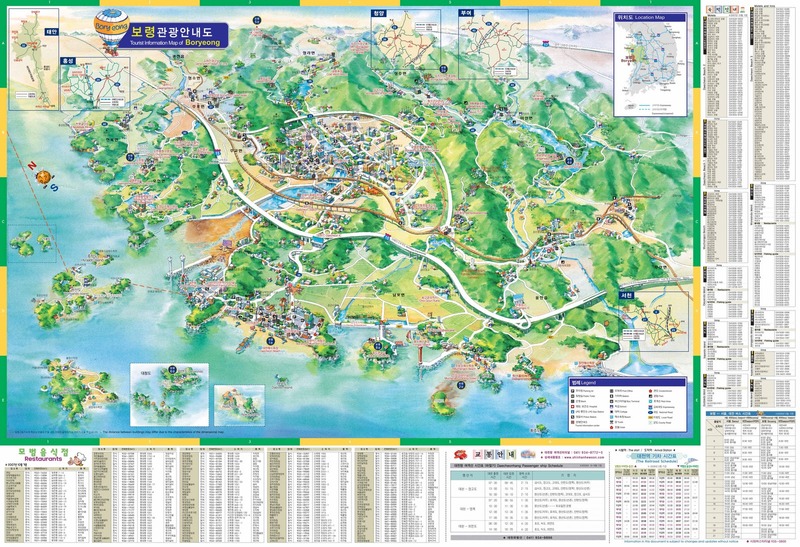 Beyond that, Boryeong is good at confining the party atmosphere to a limited section of the town. And besides, you're not into it, the mud madness is not that hard to escape. In fact, if getting muddy is your MO, the festival itself is not the first place you should go. As I mentioned before, Boryeong trucks all of the festival mud in from mud flats nearby. Interestingly, neither festival staff nor Boryeong city officials advertise this fact, and no one asks. Most festival-goers are content to wallow in the watered-down buckets of mud that Boryeong locals dump on them. The mud flats (갯벌체험장) are actually less than 5km from Daecheon Beach (where the 2010 Boryeong Mud Festival was held), at the river delta near Daecheon Station. 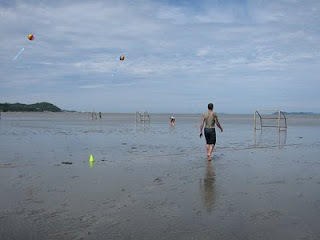 During low tide, the field of mud extends for hundreds of meters on either side of the river. 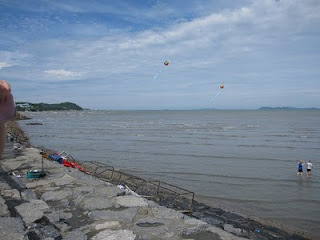 When my friends and I arrived on Sunday morning it was high tide, but the mud was only covered in ankle-deep water. I quickly stripped and covered my body in the dark, sticky muck beneath my feet. Aside from two Korean tourists and a handful of festival staff, the only sign of life around the mud flats were the seagulls, hunting for crabs. One member of the staff even helped to bury me in mud - he seemed so amused that I wondered if he had ever seen any foreign tourists out there. Shortly before we left, the staff began setting up futsal goals for a tournament which would start in the early afternoon. Unfortunately we couldn't stay and watch - our group bus was scheduled to leave soon after it began. I cleaned off in a row of showers above the rocks and we caught a taxi back to our hotel. I went last year... and back in 2008. I would go again if I have chance.